Author’s Note: This post originally was published on Upland Equations on May 19, 2013. This year, the fishing season started off slow for me. Beginning in February, I fished numerous times without success. On various occasions, I fished the Snake River not far from home, the South Fork, and the Henry’s Fork and did not move so much as a Mountain Whitefish. The last weekend in April, I finally caught two small cutthroat on a stream I have nicknamed, “TRICKLE CREEK” I was beginning to wonder if I was losing my touch as a fisherman. 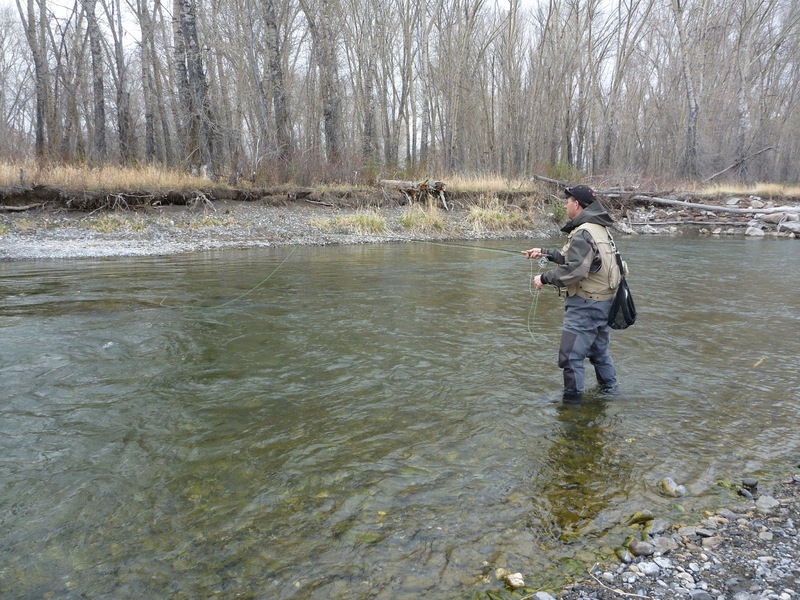 Then fortune smiled down on me the first weekend in May when my good friend, and former rodeo cowboy, Scott Johnson, invited me to fish the Big Lost River near Mackay, Idaho. When I first met Scott, he was not a fisherman, but he told me he worked with some fanatical anglers and was constantly bombarded by stories of their adventures. It wasn’t long until they wore Scott down and he succumbed to the sport. He also happened to get a bird dog last year and now we spend many days together afield and astream. To read about one such adventure, follow this LINK . It has been fun to see the addictions take hold such that Scott is now a fellow Bird Brain and Mad Trouter. 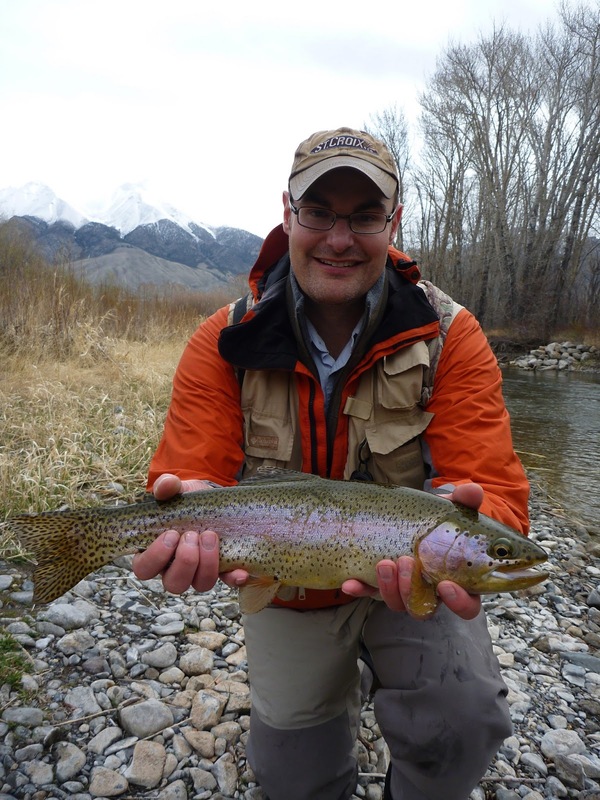 The Cowboy, Scott Johnson, now suffers from Trout Madness. 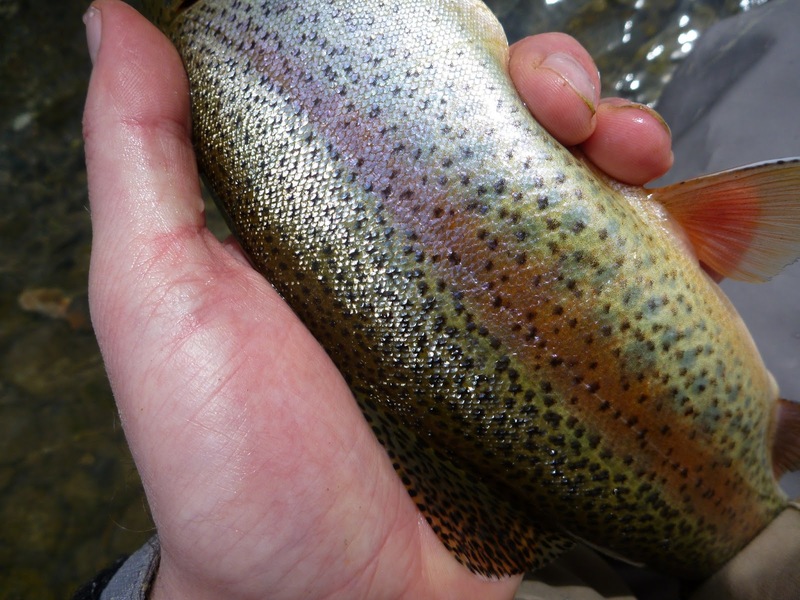 Scott holds a beautiful, wild Big Lost River rainbow. We left early Saturday morning and headed west to Arco. The weather looked a little testy as black clouds enveloped the Lost River and the Lemhi Mountain Ranges to the north. Once we turned up the Big Lost River Valley in Arco and headed north, however, the clouds began to dissipate. In fact, we could see an new fresh snowfall on the peaks of the mountains above the treeline. The way the misty clouds lazily draped over the majestic mountains was idyllic, almost Middle Earth-like. One of my favorite things about fishing and hunting is exploring new places or rediscovering places that I once knew but haven’t been to in years. I had fished the Big Lost a few times after law school and during my law clerkship and I really liked it, but it had been over ten years since I last cast a line on its waters. The Big Lost is the biggest of Idaho’s three sink streams that disappear into the desert and reappear about a 100 miles away at Idaho’s 1,000 Springs on the Snake River near Hagerman, Idaho. The other two such rivers are the Little Lost River and Birch Creek in the drainages to the east of the Big Lost River Valley. Before they sink into the miles of lava rock desert, each river offers excellent fishing. When we arrived and I observed the river, although I had never been to this particular stretch before, I was struck by how familiar the river was to me. The Big Lost River looks and feels much like the Big Wood River, which I know and love dearly. I fished the Big Wood River almost daily when I clerked in Hailey for two years. Like the Big Wood, the Big Lost River runs through a beautiful valley surrounded by cottonwoods in the riparian area with majestic mountain ranges on each side. But I would soon find out that the Big Lost River supports more and bigger trout than its renowned brother to the west. 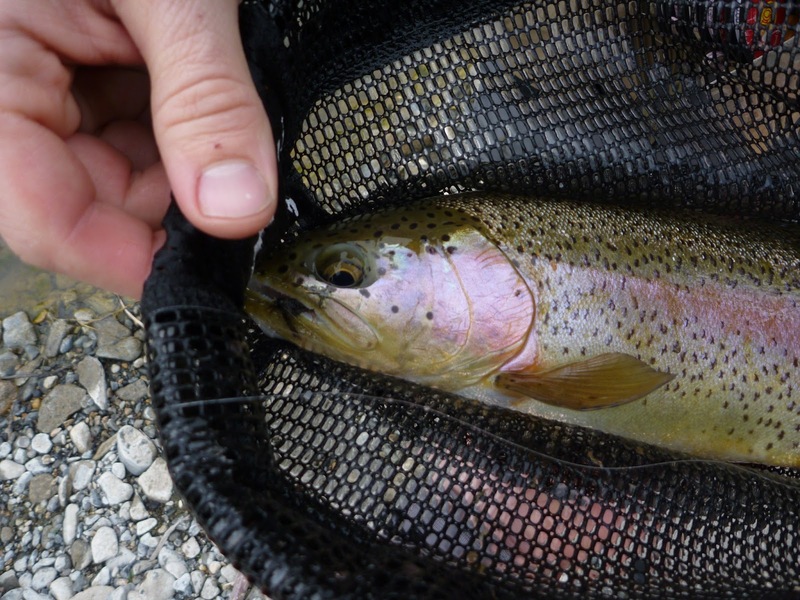 The Big Lost supports wild rainbows, brook trout, and white fish, but the real stars of the show are the acrobatic rainbows. Shortly after stepping into the flows of the river, this crazy, monster trout blazed a foot out of the water and bolted downstream for no apparent reason. “What the heck was that all about?” I asked Scott with a smile. “Every time I come to the Big Lost, the fish jump like that for no apparent reason.” Scott responded. It wasn’t long before I hooked my first fish in a small riffle on a Tungsten Bead Head Red Fox Squirrel Nymph, and, after that, the action was steady. I hooked numerous crazy, jumping, tail-walking rainbows that tested my skills and tackle. 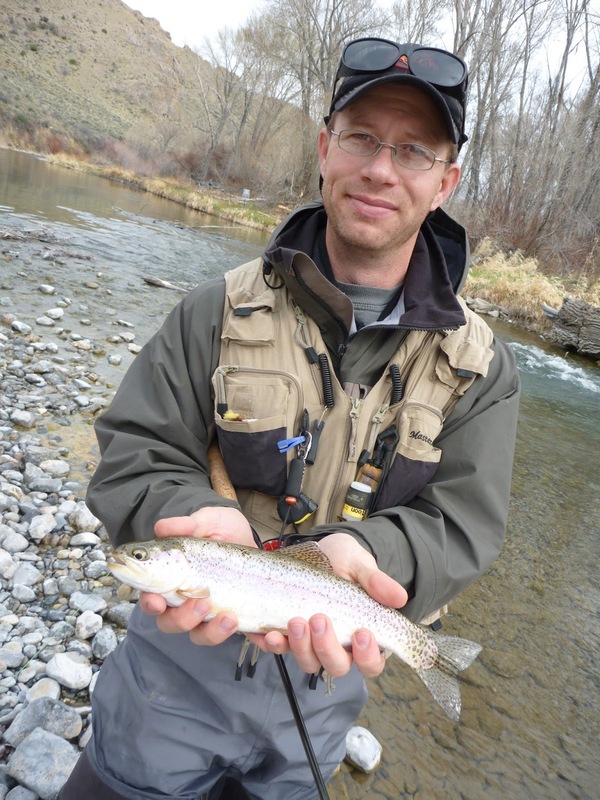 Scott also experienced some success on the river’s numerous inhabitants. For me, the most memorable fish of the day came in a riffle alongside the second nice plunge pool downstream from the car. 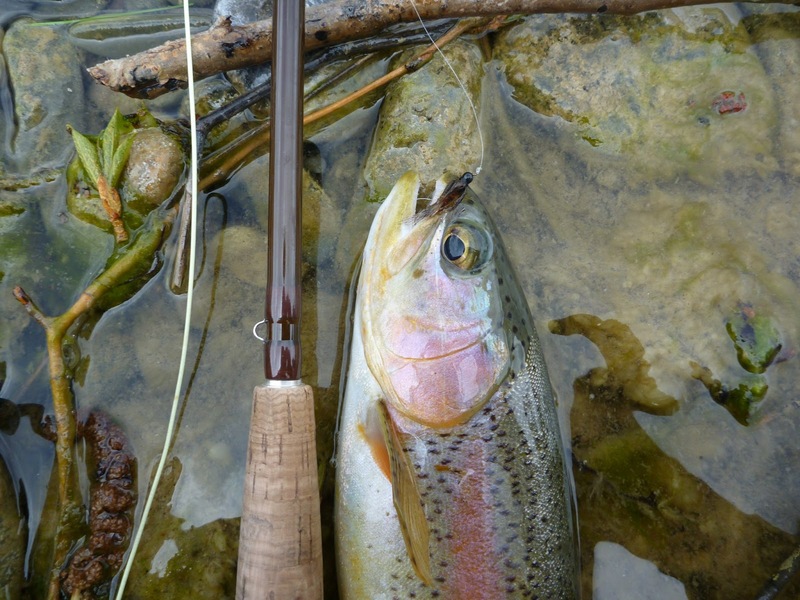 When I cast, I instantly saw a huge red-sided rainbow roll in the strong current beside me. So, I set the hook just in case he took my fly. Of course, he chomped the Red Fox Squirrel Nymph, which has to be my all-time favorite nymph, especially on Idaho’s freestone rivers. When he felt the hook’s bite, he blasted out of the water, tail-walked, and ripped line off the reel downstream to the next hole where we battled it out until Scott graciously netted him for me. For all I know, this may have been the very same crazy fish that we saw jump first thing that morning. This supercharged rainbow put on the acrobatic show. Check out the snow-covered peaks in the backdrop. After the lack of catching so far this year, I relished this day of fishing. It was the best day astream I have had in so long and the backdrop was absolutely stunning in this majestic mountain setting. I have a new love in my life . . . The Big Lost, Baby!!!! Love those wild redsides too! If you like this post, check out my book, Heaven on Earth: Stories of Fly Fishing, Fun &amp; Faith. Thanks for stopping by.